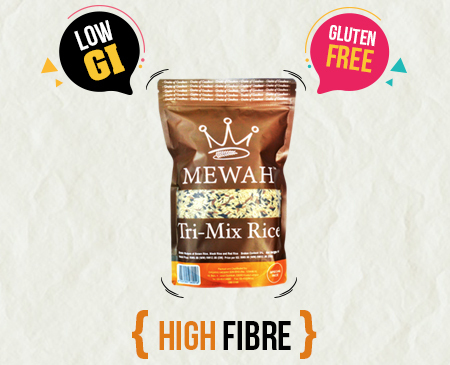 Want the superior health benefits of Black, Red and Brown Rice in one awesome package? Our MEWAH Tri-Mix Rice is your answer. The brilliantly colorful and aromatic mix contains mega antioxidant power, derived from the individual bran and germ of all three types of rice that uniquely retain Anthocyanin. Combined with its Low Glycemic Index, Tri-Mix Rice brings together the best of all worlds to help consumers prevent chronic diseases, obesity and tiredness, as well as improve your regularity of bowel movements and ease constipation.